Have you ever wanted more time? More time to get things done and more time for you to live life? Just having an extra hour in the day or an extra day in the week would make life a bit easier wouldn't it? Time management is one of the biggest challenges we face as businesses and people. There are only so many hours in the day and only so many days in the week. In that given time frame, we must accomplish a certain number of tasks in order to be efficient and proficient at what we do. If we're not good at what we do, even if we do it fast, it can take too long to get the necessary result or outcome right. If we're slow at what we do, we might get the necessary result or outcome right but again it can take too long. Both instances are a problem.So what do we do? We schedule our work and our life in order to dedicate the time needed or the time allotted to accomplish all the things that have to get done and that need to get done. It seems reasonable to most people to operate in this fashion. However, as most people will attest, we always seem to run out of time to get things done and we never seem to have enough time to ourselves-which is what we really want!Is there a better solution? Yes, there is. It's called freedom management. Instead of allowing time for all those necessary tasks and hoping that there is some time left over for us at the end, which there never is, it's best to schedule that time for ourselves first and use the rest of the time to get things done. The leverage comes from using your freedom time to recharge, be happy and get focused so your productivity time is at optimum. As they say, all work and no play make you a dull person. And it works. If you give yourself four hours to get something done, you'll use all four hours. If you give yourself three hours to do the same thing, you'll get it done in three. A given task will always fill the time allotted and you will always operate at a level of efficiency and proficiency given the nature of a situation. Because you can control the nature of most situations, you can also control your tasks. So from now on, instead of cramming your free time into your schedule, schedule your free time first and then cram in the work. You'll be surprised at the results when you actually accomplish more in less time. There is a valuable lesson in freedom management versus time management when it comes to health, especially in the workplace. Most people and businesses operate with a focus on their desired product, service and revenue at the expense of their health, wellness or lifestyle. Then, if and when a health issue arises, which it most certainly will, we dedicate resources to deal with the problem so we can get back to work. As we know statistically and experientially, this costs businesses time and money. It also creates tension in the workplace and affects the corporate lifestyle of the company. Fortunately, there is a better way. Just like our example of trying to squeeze in more personal time with all the work we have to do, most people are living life trying to squeeze in all the healthy things they should do amongst all the work they have to get done. This is a challenge at best. Interestingly, if time is scheduled and built into our day through habits and defined initiatives, we can invest in our health while we work so that not only do we gain the health benefits but our work quality and quantity also improves. Again, this is supported by the current research and the case studies regarding wellness in the workplace. Once a health problem exists, it takes much more time and money to heal, recover and treat that problem then it would have to prevent it in the first place. Just like customer service, if there are procedures and systems in place to deliver the best experience for buyers and people who use our products, we can avoid the scenario where a customer encounters poor service or a bad product, which then takes considerable resources and expenses to counteract. After all, a happy customer is a repeat customer willing to spend money! Similarly, a healthy employee is a performing employee. The benefits, however, go beyond the workplace and affect the employee's entire life. When the company plays such a pivotal and vital role in the health and welfare of its team, the rewards are significant. The business is more productive with lower costs on health claims while the employees are happier and more in tune with life and work. This is what happens when there is a focus on health promotion versus disease management. Yes, diseases, illnesses and injuries will happen and you will want to have a plan and the resources or benefits to deal with them when they do. However, this should not be the entire management plan or the selling feature to employees. It's good to know you're going to be looked after when and if something does happen to your health, but it's even better to know that something is being proactively done to ensure that likelihood is being minimized. That's the kind of company we all want to work for and with. In the end, disease management is nothing more than symptom treatment, crisis triage and a final product of things gone wrong. It's a fight to make up for what could have been and what should have been and what will one day be true health promotion in the workplace. By adopting physical, chemical and emotional strategies for helping employees with nutrition, exercise, ergonomics, stress reduction, environmental adaptation and rest periods, the workplace will no longer be a place where we get drained, rather a place that energizes and revitalizes our lives for the better. 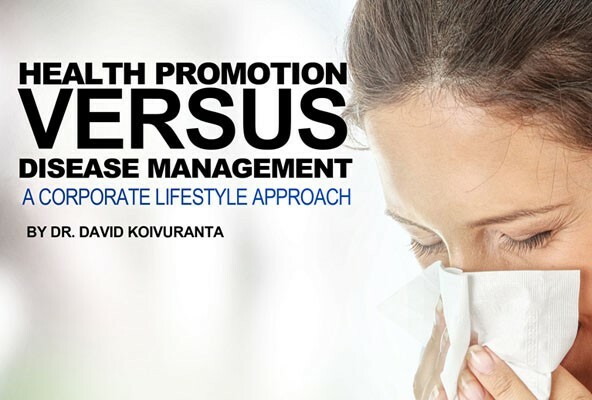 Time Health Management is a corporate health and wellness company operated by Dr. David Koivuranta. It is founded on over a decade's worth of experience and knowledge derived from treating employees suffering from ergonomic stress, strain and disease. It's time to manage your corporate health, visit www.timehealthmanagement.com and contact us for a free business wellness evaluation. Learn why our workplace wellness solutions make sense. For more information email drdave@timehealthmanagement.com or call 416-697-7918. Ask us about our 5 minute onsite ergonomic and stress reducing system, perfect for every business.